The Advocate is usually dedicated to advocating the merits of an advertising campaign in an attempt to prove that the work that we love and instinctively believe in actually works. I’m plain out of this stuff at the moment – not much is floating my boat this January – so I thought we might have a think about PG Tips and their revival of the ITV Digital Monkey instead. Richard Dawkins (for it is he) makes a distinction between temporary agnosticism in practice (TAP) where you remain agnostic because you don’t have enough information to make a decision and permanent agnosticism in principle (PAP) in which no amount of information will cause you to come off the fence. When it comes to PG tips (the second largest UK tea brand after Tetley)I am an agnostic but agnostic in practice not principle. 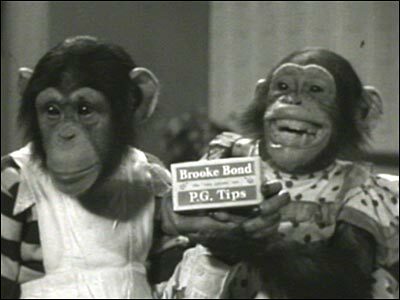 PG Tips has an outstanding communications legacy in the UK, running one of the longest lasting advertising campaigns in history – the PG Tips Chimps. The campaign launched in 1956 and holds the record for the ad shown the most times on British television (Mr Shifter). Rightly or wrongly, as so many brand owners seems to do, they ditched their primate icons in 2002. While this seems a classic case of crass advertising patricide, we can all appreciate that making real chimps behave in an anthropomophic fashion doesn’t really chime with contemporary ideas of animal welfare and made the brand look a little out of touch. So they made a ghastly new campaign with claymation pidgeons and then called a pitch – that’s the way it goes in advertising ladies and Gentlemen. Fortunately there is little evidence on You Tube of this work but you can get a feel for it here. Then along come Mother who have been desperate to find a use for the ITV Digital Monkey since the people that paid for his birth collapsed into finanacial ruin at in the early part of the decade. I guess Mother kinda went ‘You know, monkeys and chimps, get it!’ and bobs’s your uncle PG Tips had a new ad campaign that has half a chance of gaining some traction out there. My agnosticism is because I can’t work out whether this is genius or sheer folly. On the one hand this work will be noticed and talked about. Advertising awareness scores will go up (and maybe even brand awareness)and some of the likeability of the advertising will map onto perceptions of the brand. After all this is an ad that showcases both outstanding writing and acting and is that rare thing at the moment – a genuinely enjoyable piece of communication that is welcomed into our homes. Not to mention that I sort of buy the chimps and monkeys thing as a moderate homage to a glorious past. On the other this smacks of a brand with a once proud communications legacy that, post claymation pidgeons, has completely lost its confidence, content to grovel on the floor of the advertising world for any scraps it can pick up in a desperate attempt to be noticed. These will never be the PG tips ads, they are the ITV Digital Monkey ads that PG Tips are using for a while and as such suffer from all the attendent problems of borrowed interest like misattribution and a difficulty in converting advertising appeal into effect. More seriously I find it distressing that a brand with such stature in its market has nothing to say to us about itself or the wider world beyond a rather weak and generic injunction to ‘put the kettle on’. Is this genius or folly? Will they sell some tea? Is this the platform to take back the number one position from Tetley? Fake birds didn’t sell tea. A fake talking monkey will sell some tea but DEFINITELY not all of it. The problem = fake animals don’t sell things as well as real ones (review the above facts for evidence). I think that they missed a trick. Bruce Forsyth looks uncannily like a chimp AND is available to sell tea. Someone get on a phone NOW. Why he hasn’t been snapped up to sell tea is a real mystery and probably a major source of embarrassment for the industry. The clue is his name. All depends what it cost. Do you think Mother sold it cheap as an *cough* off-the-shelf product? Made me laugh. Made we think about PG Tips. Which I haven’t done for years. And I’m sure it will get loads of people talking, and in the process shift some bags. Is it a long running idea? Probably not. But do brands have to rely on the big ad campaign alone nowadays? Afterall, it fits well enough into the broader PG Tips-iverse (JG’s brand molecules and all that). And I even like the line. Completely agree that it’s a bit generic. But there’s something really nice about the tone I think. And in our mad, hectic, disconected world, I think it does have something bigger to say (whether intended or not). It taps into that lost art of taking time out to sit down with a nice cup of tea and just talk or ‘be’ – something PG Tips is well place to own. And a lot less sledgehammer than the more overt Bisto approach to a similar theme. After the terrible claymation ads I think this is a good step in the right direction. People identify with the monkey, and the combination of him and Mr Vegas will speak well to the average household. Considering Tetley’s extremely lacklustre advertising recently, I think its a bold move to reposition PG Tips as a brand and take some of their market. Most tea ads are seemingly aimed at the older generations, while its an old character, its aiming for the young. If it works it could create a long association with the brand in the younger generations who have never connected with the antiquated ads of most tea makers. It is, without a doubt, complete genius. I would put my mortgage on PG Tips reclaiming the No.1 spot in the tea market very soon. Let’s face it, tea is a completely generic product. Affinity is the only differentiator – it’s all about how much people like the advertising. If I could I would buy shares in PG Tips but you can’t because it’s part of Unilever. I’m with Scamp. I’d put money on it. If I was a betting muppet. My thought when I first heard about the reunion of Mother, JV and Monkey months ago was ‘folly’. How were they going to slap one brand’s equity onto another’s without buggering it up? It seems the answer is through brilliant writing, a neat tip of the hat to the past, and a celebrity fit that is far comfier than the ITV Digital one ever was. It genuinely surprised me but they did it, and they did it beautifully. (I’ve tried very hard to ignore the Dawkins part, and I’m just…about…managing). I had the pleasure of tracking the monkey ads for ITV Digital. They did fantastically well, some of the best advertising I’ve worked on, but it was too late for the brand. It was a great example for the debate about how big an effect advertising can have on a brand. And now – it will become a great example of whether a creative idea can be reused for a completely different brand. I’m putting my vote in the “genius” box also. Firstly, I love the “put the kettle on” line for all the reasons already pointed out by Jon -it’s real and inclusive and welcoming… (amazing no tea brand has nabbed it before, really). Secondly, to your concern about the brand being “content to grovel on the floor of the advertising world for any scraps it can pick up”: I don’t think that the public give a toss one way or another. To people outside our funny little world, JV and Monkey are a well-loved bit of pop culture (as evidenced by Dom just above here) who may have once been associated with something that didn’t quite work. Haven’t we all? Next. Big ups Mother -it’s a cracking ad, beautifully written and superbly realised (I especially like the ‘monkey-strapped-to-the-truck’ flashback). JV says alcohol to me. Monkey says one of the biggest business debacles of recent years. And the T’Pau reference just emphasises the has-beens vibe. It reeks of “advertising” . Whether that will be the reaction of the general audience I have no idea, but in what I believe is a declining market, I side with Richard’s dismay that it says nothing about why I should love the product. They’ll reclaim the number one spot, it feels a bit vacuous, but it made me chuckle. Seems a shame to leave some of the heritage behind, but I’d be interested to see how they develop the idea in future executions. Tea doesn’t have the same maternal role in the house anymore, so those soft fluffy feelings the chimps or latter day ‘monkey’ tap into are particularly relevant, for me. Waste of time for PG tips. Great business for Mother. smacks of ad industry navel gazing to me. the monkey/vegas combo was well loved at the time, yes, but hardly a cornerstone of uk popular culture. i can’t imagine anyone outside of the four walls of mother was living for the day they returned to the screen. yawn. In conclusion, I don’t want a cup of tea but I REALLY want something to do with monkeys, so I don’t think the advertising has worked in this case.